The Swedish outfit will perform at the Forum in Inglewood, CA on November 16 and New York's Barclays Center on December 15. Tickets for the shows will go on sale Friday, May 4 at 10:00am local time. Already set to launch the new record on a spring North American tour that begins in Riverside, CA on May 5, Ghost revealed the fall shows during a live-streamed press conference from New York City’s Irving Plaza on Monday. 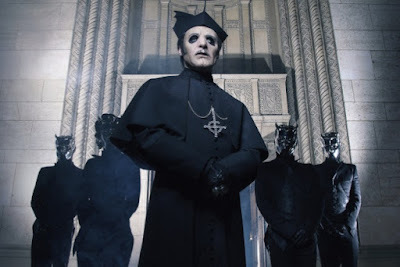 The Cardinal – who has heterochromia iridum, a condition where the iris of one eye is a different color than the iris of the other eye – replaces outgoing singer Papa Emeritus III following his work on their third album, 2015's "Meliora", and 2016’s "Popestar" EP.